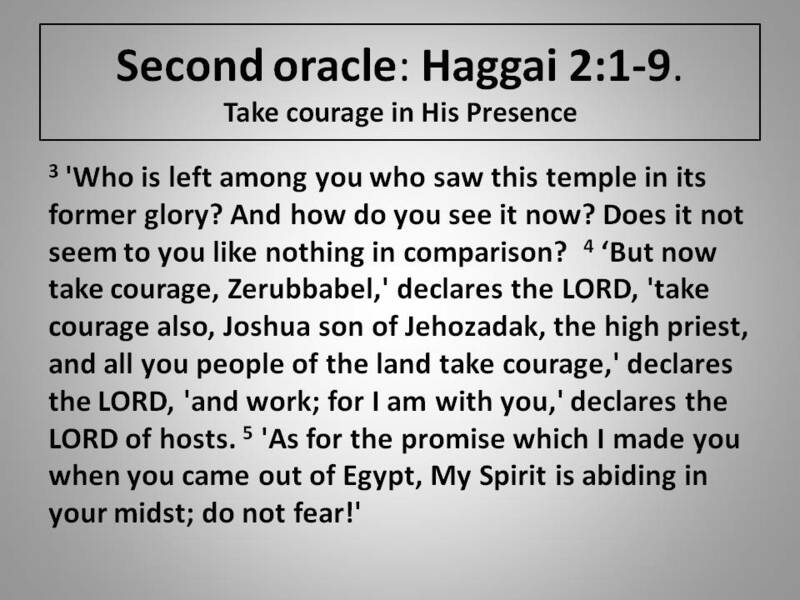 Take Courage in God’s Presence and Plan: An Exposition and Application of Haggai 2. Today’s post includes the second installment of a recent sermon series on the book of Haggai. If you are looking for a short, expositional series, then Haggai can be covered in only two weeks. In the actual preaching, I added different illustrations and/or went deeper into certain areas based on the congregation. You can listen to the sermon series at: http://gracefortheway.org/sermons/series/the-book-of-haggai. If you listen and compare the written version below, you will see that any sermon notes or manuscripts are tools to organize a sermon. Just as the Spirit guides in the sermon preparation, the Spirit should guide the proclamation. Life has so many twists and turns. We really should admit that for the most part we have no idea how things will turn out. Sometimes we are happy-surprised, sometimes we are disappointed-surprised. For instance, when the Star wars prequels came out, everyone was excited to get the back story of Darth Vader. Then right away we were hit with the disappointment that is Jar Jar Binks. Of course there are many more important things in life, which lead to even more profound disappointments: career plans that fall apart, a child who has walked away from the faith, a difficult marriage. There are many things in life that take an unexpected and discouraging turn – that is the human condition, and the people of God are not immune. The people of God in Haggai’s day had to deal with discouragement. As discussed last time, God told the Israelites to rebuild the temple, and they actually started to do it! In Haggai 2 discouragement sets in. 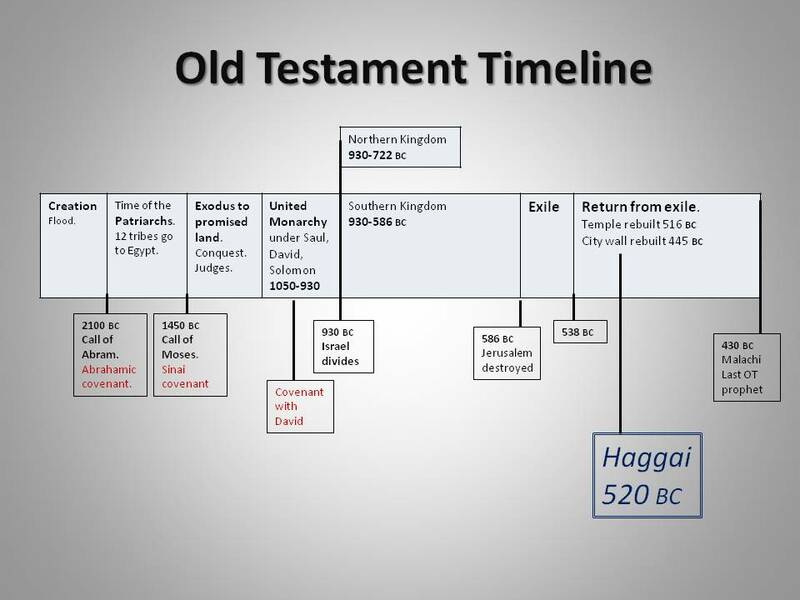 Before diving into Haggai 2, let’s quickly review the historical context. In 520 b.c. the word of the Lord came to a prophet named Haggai, who delivered God’s message to rebuild the temple. The message was directed first at the leaders Zerubbabel the governor and Joshua the high priest, but also to all the people. Despite being back in the land for over a decade and being able to build their own houses, the Israelites had not rebuilt the temple. Haggai 1 contained the first message (or oracle) of God telling the people to make God’s plan a priority and rebuild the temple. In a wonderful turn of events, the leaders and the people obeyed the voice of God and started to rebuild the temple. Haggai 2 contains the prophet’s messages in the following months, after Israel began the work on rebuilding the temple. These messages were mostly designed to encourage the people in their work because when they decided to follow the Lord, there was still disappointment and difficulty to overcome. Haggai 2 contains God’s messages of encouragement. Both the Israelites of Haggai’s day and we can be encouraged through God’s reassurance of His presence and that we are a part of his larger plan. 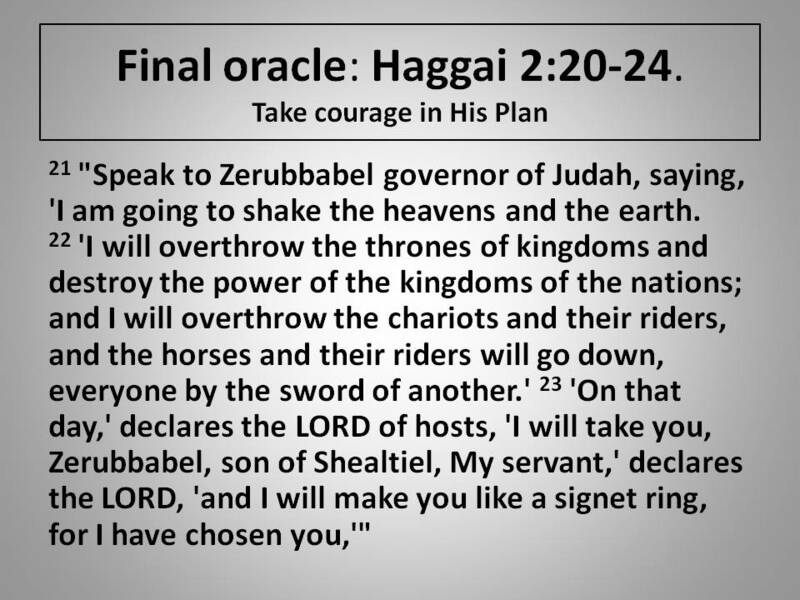 Haggai’s second oracle (the first constitutes Haggai chapter 1) makes up 2:1-9 and was given about 7 weeks after Haggai’s first message and 4 weeks after the people had actually started the work. For some reason, the people were getting discouraged. Perhaps clearing the debris was taking longer than they thought, or perhaps it became apparent that for all their work, this temple would not be as splendid as the previous temple. In response to their discouragement, the Lord sent encouragement through Haggai. (Read Haggai 2:3-5). This temple lacked many of the glorious things of Solomon’s temple. The people did not have the gold, the Ark of the Covenant, or many of the other things that were in the first temple. But ultimately the temple was about the presence of God. All the gold and fancy stuff were meant to illustrate the truth that the glorious God of Israel was among the people. Now that they returned to the covenant, they were assured that God was with them. When we walk in God’s will, we have the reassurance of his presence. If we are walking in step with his plan, as the Israelites are now doing, we are reassured that he is walking with us (or more accurately we are walking with him). Our works don’t earn a place with God, rather we place ourselves in a position to experience God’s presence and receive God’s grace and be a part of his plan. In his book, Fresh Wind, Fresh Fire, Jim Cymbala compares the relationship of our works and God’s grace to surfing. Our obedience to God’s will is like paddling out into the ocean. We put ourselves in position to ride a wave of God’s grace, but God sends the wave. While the ocean is sometimes quiet, we know the waves inevitably come. Likewise, when we walk in step with God’s plan, we are assured of God’s presence. By responding to God’s word in obedience and getting back in step with God’s ways, the people of Israel can know that God is present with them and will provide for them as they take part in God’s work. God is with them now just as he was with them when he first made the promise to be with them when he led them out of slavery in Egypt centuries earlier. What a reassurance because if you have the God of the universe with you, then you have the greatest thing in the universe already! The people were responsible for obedience, and then they were to leave the rest up to God and take courage because “he was with them”. The people can’t see it now, but what they are doing is a part of God’s plan. This temple would one day be more glorious, and people from all over would stream to it. This prophecy has two levels of fulfillment. One is that in the first century BC this temple was totally rebuild by King Herod and became much larger and much more opulent than the first temple. Jesus, the king of glory, also would visit this temple. But the ultimate fulfillment, when God shakes the heavens and the earth and brings a lasting peace and the nations come to worship God, happens at the end of days in the new Jerusalem. The people can’t see all that. They only see what is in front of them – a temple years away from completion and one that seems like it can never be as good as the first, let alone be a part of God’s ultimate restoration. God is encouraging them that they are only responsible for their small part and they can trust in God’s presence and plan to do the rest. The next oracle, verses 10-19, is given about 2 months later. This message involves Haggai asking the priests for a ruling concerning ritual purity laws. These rulings are then used as an applied illustration to the people. The people are impure because of their exposure to the “dead body” of the ruined temple. Whatever they have done or offered as sacrifice on the altar the previous decade has been defiled (remember the altar outside the temple structure was rebuilt shortly after they first returned in 538 bc). Because of this defilement, verses 16-19 talk about the covenant curse of famine being upon the people. Their defiled offerings were a breach of the covenant, so they were reaping God’s disfavor. But now that they have returned to covenant faithfulness by rebuilding the temple, the end of verse 19 says, “Yet from this day on I will bless you.” They should not let the past consequences of their disobedience discourage them because with the change in the people’s obedience comes a change in God’s handling of them. These words are another encouragement and reassurance from the Lord to keep on following the path of obedience in building the temple. “I am with you and I will bless you” – don’t let the past discourage you from this new present and future. Zerubbabel is directing the people in a work that will lead to God’s promised restoration and victory. Like previous references to a servant of the Lord in the OT, Zerubbabel, as a descendent of David, has been chosen by God to advance his salvation plan that will end in the kingdom of God reigning supreme and all enemies of God defeated. That message should encourage the people! Knowing that you are playing a part in God’s epic plan of redemption will help you through the drudgery of working in the hot sun and dragging 5 ton stones into place for the next 4 years! God is telling His people to take courage in the fact that this difficult work is part of God’s larger plan of world-wide restoration. This promise presents a difficulty. If we fast forward 10 years after the temple is rebuilt, Zerubbabel is out of the picture. Historians don’t know what happened to him because he passes from the historical record. Obviously, Zerubbabel isn’t the Davidic king who reigns during the new age of restoration. 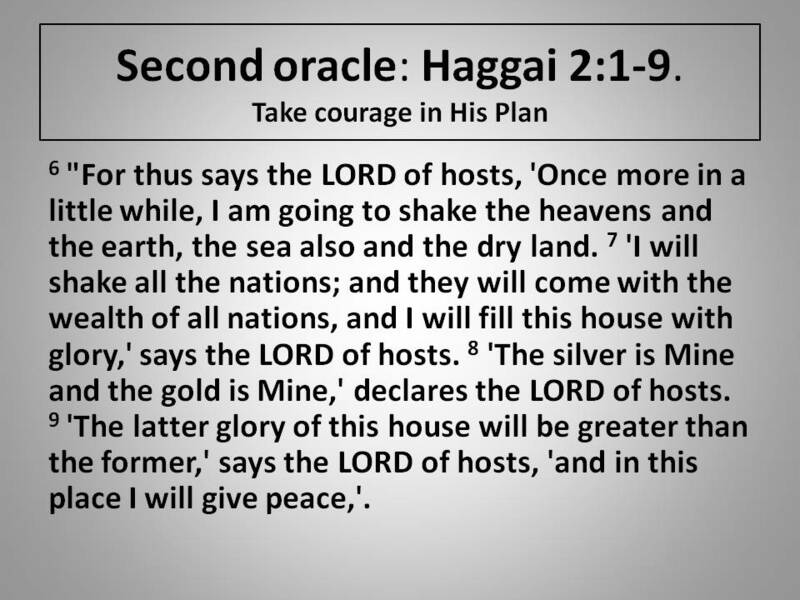 The promise of Haggai’s final oracle encouraged the building project, but it didn’t turn out how many thought. Zerubbabel does not reign in the final restoration when the nations stream to the temple to worship God, and God’s people are preeminent. That event will not fully happen until the second coming. But Zerubbabel is a “signet ring,” which was like a signature, meaning that Zerubbabel functions like God signing his name to fulfill that previous promise. Zerubbabel reestablishes the Davidic line along with the reestablishment of the temple (king and temple go together) meaning that God’s promises are still in effect. And we know God keeps his promises, not how we always foresee, but he keeps them nonetheless. The Israelites should know God often keeps his promises in unexpected ways. God kept his promise of returning the exiles to the land through a pagan king. In Isaiah 45:1, Cyrus the Persian king even was called “God’s anointed,” (the same word for “messiah”) for bringing the exiles back from captivity. The Israelites probably were not expecting God’s anointed to be a pagan gentile. Even though Zerubbabel’s leadership was short lived, he played his important part. He had the anointing to lead in rebuilding the temple. It was up to God what happened next. In God’s plan rebuilding the temple was all Zerubbabel was to do. An important role that lasted shorter than the Israelites expected in light of Haggai’s prophecy. Nevertheless, the promise of a Davidic king who would usher in a new covenant, a new era of restoration, and establish a temple built without human hands – that promise took another step towards being fulfilled. Zerubbabel was listed in both Matthew and Luke’s genealogies as an ancestor of Jesus, who would be the Messiah that ushered in the new age of restoration, forgiveness, and establish a new temple that included all the nations. This is the temple of God’s people with Christ as the cornerstone (which was discussed last post). Application: Life can take all sorts of twists and turns. Even as we place our faith in God and take steps to advance his plan, we will encounter discouragement. Haggai 2 encourages us to be obedient in our part, how ever small that might be. 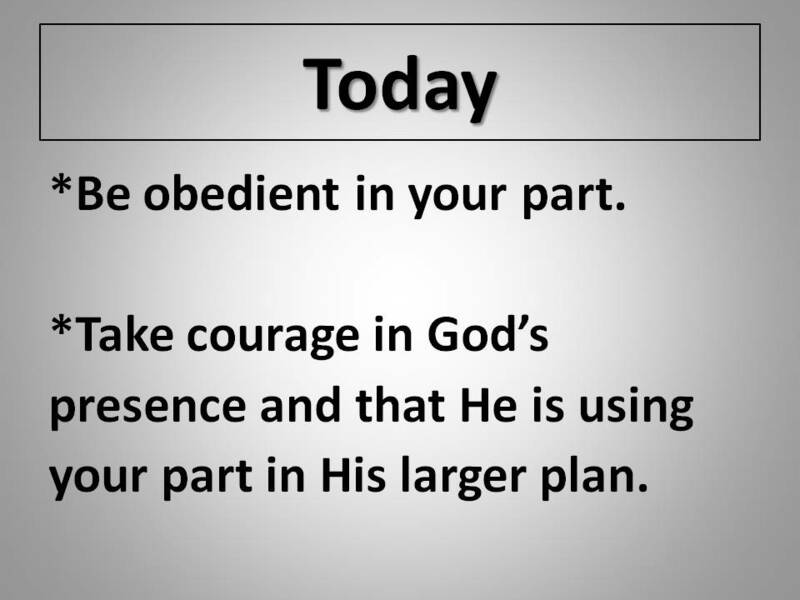 Take courage in God’s presence and that he is using our part in his larger plan. That larger plan involves a salvation and restoration that involves the entire universe for eternity! One can’t find a more important plan than that. What might that type of obedience in our small part look like? An example can be found in a man named Daniel Nash. Daniel Nash was 48 years old and after a couple of unremarkable pastorates in upstate New York, he probably was discouraged that his life and ministry had not quite turned out as he had planned. He wanted to be a part of what God was doing, but things had been rather underwhelming. Circumstances changed when Daniel Nash met a traveling preacher named Charles Finney. Nash joined Finney’s traveling ministry and took part in a time of revival known as the second great awakening (1820s). Nash’s part was to go to a town a few days before Finney arrived and gather people together to pray for the Spirit to move. Before and during the revival meetings, Nash prayed – that was the part that God had called him to do. On one occasion, a group of rabble-rousers threatened to violently break up the next meeting. Nash came out of his prayer place and told the leader of the bunch that within a week his gang would be broken up and helpless to follow through with their threats. After saying those bold words, Daniel Nash prayed for it to be so. Sure enough the lead troublemaker came to faith and led several of his accomplices to the Lord. Daniel Nash was an unknown person to his contemporaries and to history, but he was obedient in the small part that God had called him to. The result was that Nash experienced God’s presence and took part in building God’s kingdom in remarkable ways. Things didn’t go the way that Daniel Nash had planned, but he experienced something even better: God’s presence and plan. How about you? Are you discouraged in some part of your life? Perhaps you have been obedient to God’s call, but things are not turning out as you thought. Take courage knowing that as you walk with the Lord – you are walking with the Lord! You will experience the most precious, valuable, and glorious being in the universe! There is nothing better than God’s presence, and God’s presence is what heaven is about. Take courage knowing that your small part is a part of God’s larger plan of redemption and restoration, even when you can’t see what good it will do or how your actions can make a difference. As you faithfully follow Christ and share the gospel, know that you are building God’s temple that is made up of his people! Know that there is no plan more important than God’s eternal, universe-restoring plan. May Haggai’s words encourage you as you go through the daily grind of being faithful in the midst of a difficult job, a discouraging marriage, or other disappointment. Be faithful in your part; take courage in God’s presence and plan. 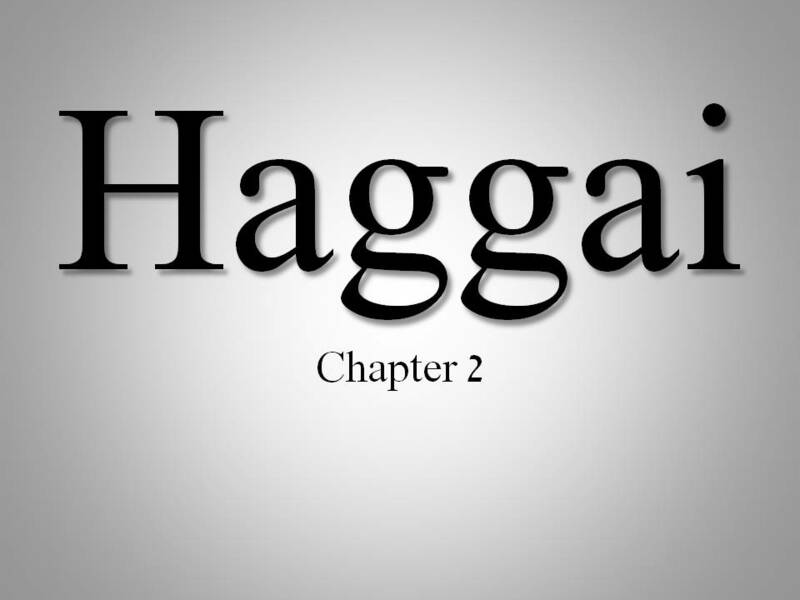 ← An exposition and application of Haggai 1. Prioritize God and his plan.